Bellator's second show in Hawaii this weekend is one with a nice balance of future, present and former stars. 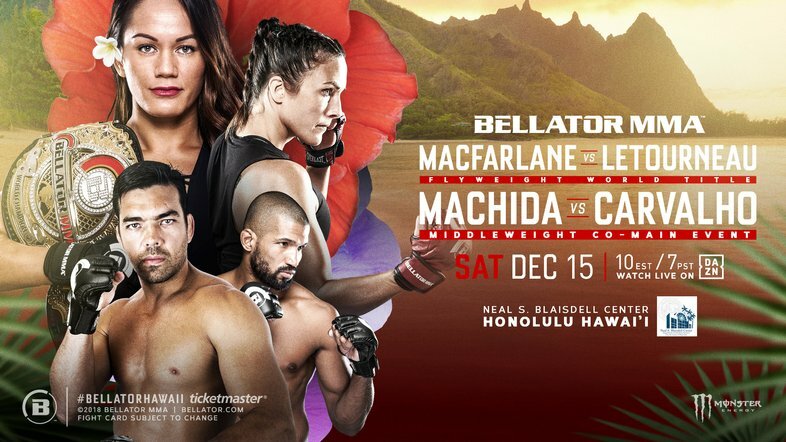 Undefeated Flyweight Champion Ilima-Lei MacFarlane looks to extend her reign over the UFC veteran Valerie Letourneau in the championship main event on Ilima's home turf of Hawaii. The 28-year old will fight there for the first time after 13 professional and amateur fights on the mainland. Bellator's Welterweight Grand Prix continues with an intriguing ground battle of undefeated fighters when wrestler Ed Ruth battles jiu jitsu specialist Neiman Gracie. The opening round winner will take on the victor of an upcoming Rory MacDonald vs. Jon Fitch title fight/tourney bout. Former Champions King Mo and Liam McGeary will have it out in a light heavyweight fight, while many questions will be answered when Lyoto Machida makes his Bellator debut against Rafael Carvalho. You can tune into DAZN for the show, starting at 8 PM EST. While it all runs on the same network, the main card technically starts at 10 PM EST. Fightful will provide full live coverage of the event, and wrap up Bellator 212 and 213 on Saturday night for an all encompassing post-show podcast.